The ASX-listed pizza maker reported global group same-store sales increased by 8 per cent and revenue by 15.4 per cent to $1.07 billion in the year to 3 July 2016, with EBITDA up 28.3 per cent to $230.9 million. Net profit was also up 28.8 per cent to $118.5m, while two-year NPAT lifted 84.9 per cent to $54.4m. In Australia and New Zealand specifically, underlying revenue was $329.5 million, up 23 per cent year-on-year, while EBITDA came in at $115.4m, an increase of 25.8 per cent. 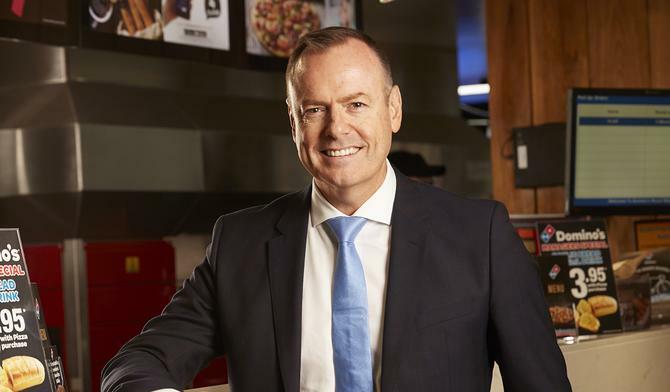 Over the past year, Domino’s opened a record 66 organic stores in A/NZ, bringing its shopfront tally to 777, and the company said it’s looking to open another 423 stores in the next six years. One customer-oriented achievement noted by Domino’s managing director, Don Meij, during an investor presentation was the launch of the ‘Taste the Colour’ menu, the company’s biggest menu change in eight years, which brought in new customers and increased sales. Also new to the menu are thick shakes, rolled out across the majority of the Australian market, the first step in Domino’s wider investment into the premium ice cream category. Project 3/10, a plan to cut down delivery times from 30 minutes to 10 minutes largely by tapping data insights, continues to run apace, Meij continued, with record week times of 17 minutes chalked up in corporate stores during the last financial year. This was achieved by combining new and improved technology, additional e-bikes and better store splits. Increased use of real-time data has been another key milestone in the last 12 months, aimed at helping franchisees and management with insights across several best practice areas, Meij said. One way Domino’s is doing this is through Workplace by Facebook, a tool aimed at giving staff and store owners better visibility of data and a platform to share wins and success stories. Meij said more than 7000 active members had signed up to the social community to date. Another efficiency improvement was the rollout of Tanda, a machine learning-driven rostering system. On the marketing front, Domino’s recent initiatives include the launch of the customer service focused campaign, ‘We Care’, which puts an emphasis on franchisees and is supported by in-store training for all team members. Meij said the company had also relaunched its 131 888 phone number, supported by ‘click to call’ technology on websites, mobiles and search, a move aimed at driving incremental sales from its offline preference customers. Online sales were upwards of 30 per cent over the year, however offline business was slower than expected. In its financial report, Domino’s admitted some growth in online sales came at the expense of offline sales, which performed lower in the second half of FY17 compared to the first half. “We know we have those customers that want to order in a non-digital way, and we have to ensure we keep engaging with those customers as well,” Meij commented during a conference call. On the list of digital achievements made in the past year, meanwhile, was the launch of DRU AI, a virtual assistant which Domino’s claimed to be a first in the Australian market. Meij said it’s also testing drones in New Zealand, nicknamed DRU Drone by Flirtey, and is in the process of upping its weight capacity to better service average customer sales in that market. Domino’s has also introduced ‘InstaGift’ digital gift cards to the A/NZ market. The AI capabilities stem from the launch of Domino's first robotic unit, DRU, last year. Overall, Meij noted Domino’s had not met its updated guidance targets but was pleased with the results. But in response to ongoing criticisms around the profitability of its franchisees and working conditions for store staff, the group made note of several milestones and improvements in this area. According to the financial report, average franchise profitability increased by 25 per cent in the last two years, while average franchisee EBIDTA after all staff and management costs was $241,000, or $134,000 per store in FY17. Over the year, 45 stores were unprofitable and received assistance. Work undertaken by Deloitte to help Domino’s improve industrial relations will also see the group investment in an enhanced monitoring and supervision framework for franchisee staff, develop a predictive risk-based data analytics tool, and improve employee complaints processes as part of a renewed action plan.